Want to make your house look superb! Try Hero Electric’s Fancy Switches!! Hero Electric has introduced various series for sockets and switches, like Golden Texture Series, Gray Texture Series, Floral white, floral black, edge red, edge gray, nice series, stylish series, stylo series, nice series, smart series, G series and piano series. The range of products varies from electric switches, electric sockets, plug & plug tops, distribution boxes, LEDs, switches & sockets combined, door bells, circuit breakers, extension cords, electric bulb holders, wall boxes, lighting products and much more. Fancy Switches are mostly liked by the clients with essence of style and supercity. 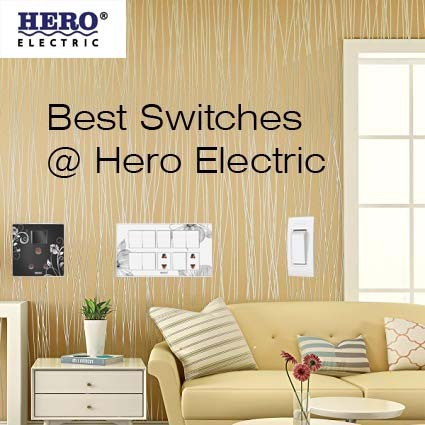 Low Cost Fancy Switches are the specialty of Hero Electric. Other than Fancy Switches, the plain and textured series are also highly demanded by clients. Each series is unique in its design. All of them are protective and easy to use with longer durability and safety. Hero Electric is also regarded as the best electric product manufacturer and supplier of Pakistan because it does not compromise on quality of electric products.